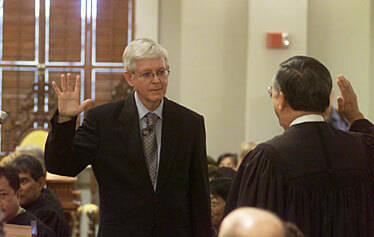 James Duffy Jr., left, is sworn in as an associate justice of the Hawaii Supreme Court by Chief Justice Ronald Moon. Duffy is one of Gov. Linda Lingle's 15 judicial appointees. In her first year in office, Gov. Linda Lingle named Honolulu lawyer Jim Duffy to the Hawaii Supreme Court. Some were surprised by the Republican governor's selection of Duffy, a respected lawyer who has close ties to many isle Democrats, including his friend former Gov. Ben Cayetano. Over the years, Duffy developed a reputation as a moderate, with some legal observers suggesting he often aligns himself with Simeon Acoba, considered one of the court's most liberal members. Last year, Duffy wrote the unanimous opinion that declared the state erred in not requiring an environmental assessment for the Superferry, a project that Lingle supports. Republican state Sen. Fred Hemmings said he does not see any irony in the Republican governor appointing Duffy. He said Lingle's hands were tied by the Judicial Selection Commission, whose members include appointees by the former Democratic governor and Democratic state Senate president and speaker of the House. "She might have appointed a lesser of evils there," Hemming said. Duffy's appointment highlighted the significant role played by the state Judicial Selection Commission, one of the most powerful and secretive panels in the state. Created by a 1978 constitutional amendment, the commission submits four to six names to the governor for each vacancy on the Hawaii Supreme Court, the Intermediate Court of Appeals and the Circuit Courts. The governor must make her appointments from the lists. In addition to Duffy, the other five names submitted were labor attorney Lowell Chun-Hoon and Circuit Judges Eden Hifo, Sabrina McKenna, Richard Perkins and Richard Pollack -- all four appointed by Democratic governors. Lingle said it was a "tough" list. "It really wasn't a very diverse group of potentials." But the governor said she does not second-guess her appointments and that she thinks Duffy is doing his best. Lingle said she did not agree with the Superferry decision and did not like it. "But it doesn't reduce my opinion of him as a person who brought a new attitude on the court that I felt was very important at the time," she said. The governor names two members to the commission to six-year terms, and Lingle appointed Philip Hellreich in 2003 and Shelton Jim On in 2005. Hellreich is former president of the Hawaii Medical Association and husband of Miriam Hellreich, Hawaii GOP national committeewoman. Jim On was a Lingle campaign supporter. Lingle said her appointments made a difference. "It's no question that it's a more diverse group that I get," Lingle said. The other commissioners include Rosemary Fazio, the chairwoman, and Susan Ichinose, who were elected by the Hawaii State Bar Association. The others are Frederick Okumura, who was appointed by the chief justice; Melvin Chiba and Sheri Sakamoto, appointed by the Senate president; and Ralph LaFountaine and Thomas Fujikawa, appointed by the speaker of the House of Representatives. The commission meets privately and the panelists refrain from discussing their work because the state Constitution mandates that the "deliberations of the commission shall be confidential." Fazio said she could not discuss whether more prosecutors are applying for the judgeships or whether more are ending up on the lists submitted to the governor. She also would not say whether a candidate's prosecutorial background enhances the person's qualifications. "You want somebody with solid experience, somebody who is a leader in his or her field, whether it is as a prosecutor or a public defender or someone in private practice," she said. "You want someone who has merit."